The latest Drax Files by Draxtor Despres is out and it features my hubby, Editorial Clarity. Watch how Edi started out as well as his plans for LTD Magazine and Interior Designs. I am in the video as well and I am honestly terrified and very hesitant to do it. I have always been very private and have avoided posting any RL pictures of myself. I am very self-conscious of my looks and have a self-image problem so this was very hard for me to do, but Draxtor was very friendly and professional which made it easier. He is the best at what he does and he did an amazing job with the video. The video also tells the story of how Editorial Clarity and I met and fell in love. We are so honored Torley Linden visited our home and Rico’s Tea House. As you can see, Edi is like awed, shocked and captured in his fan girl moment. Edi vowed to do two things. This day is now declared Torley Linden Day on our land in honor of his visit and we are going to have a plaque made with two foot prints saying ”Torley Stood here” and put it in the floor. Hehe! Torley took some pics of the sim and they are awesome. Check his Flickr. https://www.flickr.com/photos/torley. Last week, we got a tip in the tip jar from Guy Linden in the tea house. 😀 Yay. APPLE FALL have released a great set for the current round of COLLABOR88. The set includes 2 bookcases, a plant, a bow tie art, a sectional couch. magazine files, the RICO hanging clock, a wall hanging jacket, a model biplane, and a painting of Farrah Fawcett Majors. Inspired by the executive colours of masculinity, this set represents country club style at it’s finest. The dark woods compliment the muted tones of the accesories, and juxtaposes against the chrome hardware and the light fabrics. Get ALL of these items at COLLABOR88 today via the landmark below and enjoy! PS: I’ve had clothing and poses named after me but never a piece of furniture before. I’m proud of the Rico Clock inspired by Alice in Wonderland. Thank you Editorial Clarity and AF Apple Fall. Your New Decor Inspiration Is Here! Step into a fresh unique way to feature Home and Life Decor like you’ve never seen. We want to give you realistic concepts and ideas to inspire your decorating needs. We aim to be your NUMBER 1 Guide and Resource in all your Home & Garden Decor. – We feature the ULTIMATE FAMILY HOME, LOW PRIM BATHROOM DESIGNS to inspire you to create that special space and so much more! Happy Reading and remember, LOVE to DECORATE! The Cottage Will Open TUESDAY! A place for real peace and tranquility. Nestled amongst the trees, the only sounds you hear are the singing of the birds, the wild animals and the movement of the River. I think this is about the 9th 0r 10th Open House now and as far as vibes and atmosphere go, it is my favourite yet! The cottage itself is small compared to homes we have done before, but I think it all fits together in harmony. 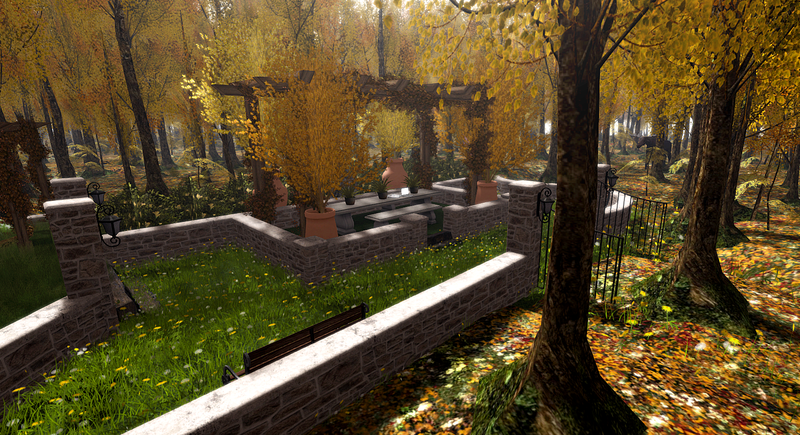 The Gardens, the little areas to sit and relax, the build, the pathways, the animals, the sounds! Everything together really works and it is such a nice place to spend time when In World!